Do you have some audio or music files that can be played on your devices or in your media player application? Or have you ever wanted to edit a recording to remove a small noise but your editor doesn’t recognize the file? Maybe it’s the format issue! Try to convert these naughty audio files to more usable and widely accepted formats like MP3. The tool you need is a piece of decent audio converter software. There are so many audio converter programs out there and what if you don’t know which one to go with? We’ve done a massive number of research and tests to present to you the best 20 audio converter software for Windows. We’ve done enough to review them so you won’t have to. Just read our reviews and choose the one that fits you most. The download source is also included under the review of each product. 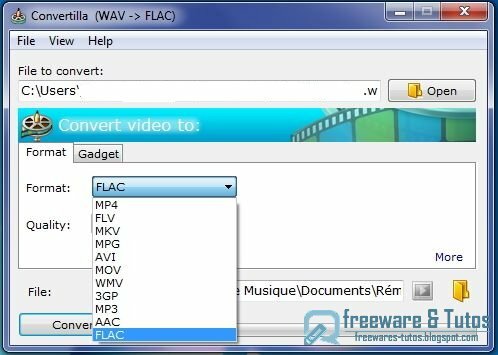 When it comes to audio conversion on Windows, it would be lunatic to skip Free Audio Converter from FAEMedia. It’s one of the best free audio converter software that does not limit you in any way. It can convert audio files between over 50 formats so far and the developer continues to add more. You can even extract audio from video. It supports batch conversion and you can set the maximum number of simultaneous conversion processes allowed. You are allowed to change the quality by changing the parameters manually or using the presets (profiles). You can also save your settings as new presets. It will enable you to cut the audio, combine audio tracks, apply sound effects and filters, rip Audio CD and edit tag info as well as the artwork embedded. A media player is integrated. There are more that you could expect from an audio converter. Check out how to convert audio files with Free Audio Converter. Freemake Audio Converter has a super easy UI, which makes its users can use it without any tutorials. You just need to input the audio files you want to convert, choose the output format along with the quality settings, and click on the convert button. Of course, you can select the output directory and it also lets you decide if you want to merge all input audio files into a single audio file. When you choose the output quality, it provides several quality profiles for each of the formats, so you don’t need to worry about the parameters. Limitations come with most of the audio converter freeware and Freemake Audio Converter is no exception. Free users are limited to only 7 output formats. 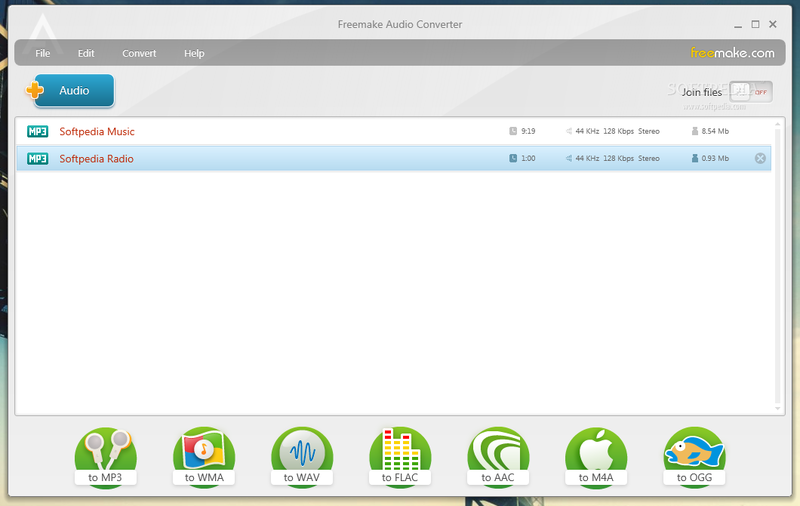 Freemake Audio Converter provides neither editing tools nor audio effects for further audio enhancement and perfection. However, it can also be used as a video converter once you install an additional piece of software. Compare to most of the other software in our list, it takes much longer to convert a 500Mb file. It is suitable for users with simple conversion needs. Free Oxelon Media Converter is an audio and video converter program to convert media files in many formats. The UI is very simple. The batch conversion can make bulky conversion efficient and you can set the max number of simultaneous conversion tasks. It will show you many details of the media files including filename, size, duration, etc. You can choose the output path and format and specify some settings like bit rate, sample rate, channels, etc. The conversion is speedy and the output sound quality is superb. Free Oxelon Media Converter does not support drag-and-drop to input media files, which means you have to input them via the file browser. Also, its UI is a bit outdated – you should think twice if you are looking for a tool with a stylish look. 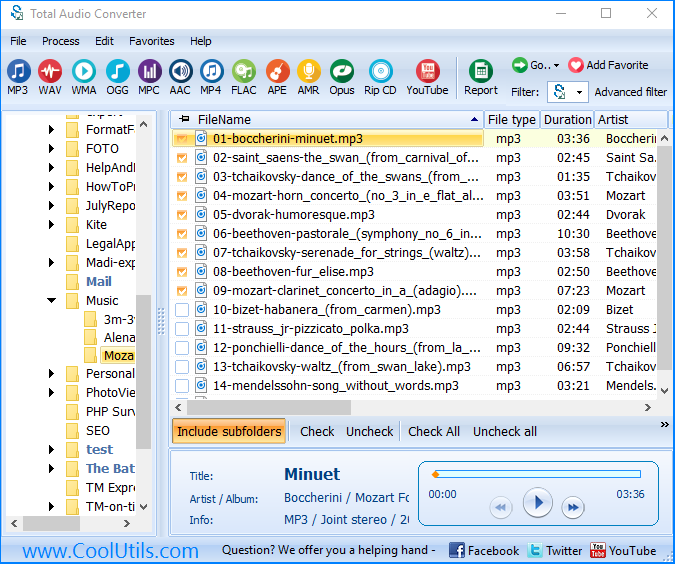 Switch Audio File Converter Freeware is a very small audio converter utility that is impressively compatible with many audio formats (while iTunes only supports 5). You can preview the audio before conversion. The UI is simple and no different to regular media converter software and you can easily input audio files, preview them with an integrated player and start the conversion with a click. The developers combine all crucial features in the main window, which is good for beginners to find what they need. It also has the capability to edit audio tags. During the installation of Switch, remember to choose NOT to install whatever toolbar(s) it comes with because they have nothing to do with the conversion. Stellar Audio Video Converter provides a friendly interface to guide you step by step to accomplish your conversion. It will prompt a large “Add Files” icon, via which you can add audio files. It is able to batch convert audio files with customizable bitrate, sample rate & channel settings. Stellar Audio Video Converter does not include audio volume adjustment features, but it’s OK if you are not in need of normalizing old recordings. It is compatible with 15 different output formats – not many but enough for various usages because all the popular formats like MP3, WAV, WMA, FLAC, etc. are supported. Aiseesoft Total Media Converter is a powerful media converter application and it can handle many types of multimedia tasks like DVD/Blu-ray ripping & burning, video and audio conversion as well as video downloading. You can convert a ton of video and audio formats to MP3, WAV, WMA and several other audio formats. You can set your audio conversion preferences. Aiseesoft Total Media Converter does not score well on several aspects in our test. The design is a bit outdated and the conversion speed is slow. The audio quality is excellent though and it has a long list of supported formats. Xilisoft Audio Converter is one of the easiest audio converter software in our list. Its effective layout allows you to batch convert audio files in a few clicks, requiring no expertise or experience. It includes conversion options for albums & CDs. It can extract sound from video and add a few audio effects. One thing to mention is that Xilisoft Audio Converter is comparatively slower than other audio converters. There will not be a noticeable difference when you are converting files in small size, but if you want to convert files over 500 MB, there are better alternatives to Xilisoft. MediaHuman Audio Converter is a straightforward audio converter which is free to use. It uses FFmpeg for the encoding process, which means it supports a large number of audio formats like MP3, AAC, AC3, WAV, WMA, OGG, FLAC, ALAC, etc. It can handle both audio conversion and video to audio conversion. What impresses us is that you can limit the number of CPU cores that will be used during conversion – this is rare because most audio converters will take up all the system resources, especially when processing batch conversion. There are many presets for the output files and also quality settings like bit-rate, sample rate & audio channels. MediaHuman Audio Converter provides both Windows and Mac versions but under Windows 10, some of its icons on the interface seem to have rough edges. However, it’s no big deal compared to its usability. 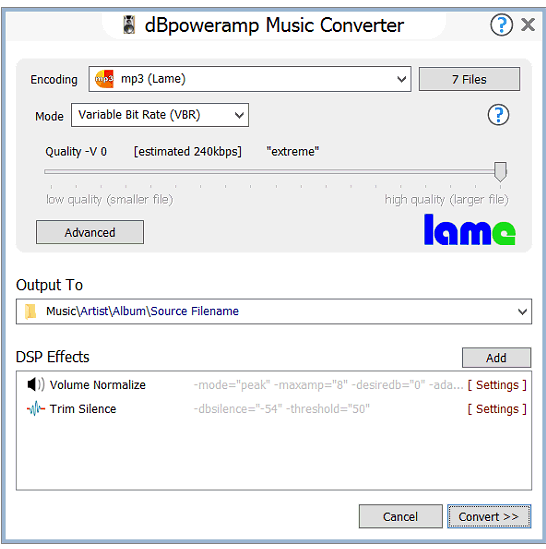 dBpoweramp Music Converter is a standard audio converter utility to convert audio files and rip Audio CD. It allows batch conversion and you can apply more than 30 audio effects to your audio files including volume normalization. It supports MP3, M4A, WMA, WAV, AIFF, AAC and many other audio formats including lossless ones. One thing to mention is that dBpoweramp Music Converter can be integrated into context menu – you can right-click on the source audio files and choose “Convert To” to add them to the converter. Hamster Audio Converter is able to convert audio files in tons of formats while keeping things as simple as possible. Hamster Audio Converter’s main window is clean and well-arranged. Just drag and drops the audio files you want to convert to the program interface and then choose one of the ready-made profiles for the output files. It allows you to output audio files in MP3, WMA, WAV, AC3, OGG & AIFF formats. It supports ID3 tag editing. Hamster Audio Converter only supports Windows 7 & older versions. It took more system resource during conversion so it would be better if the developer could add some features to limit the maximum CPU usage or reduce the priority its CPU usage. 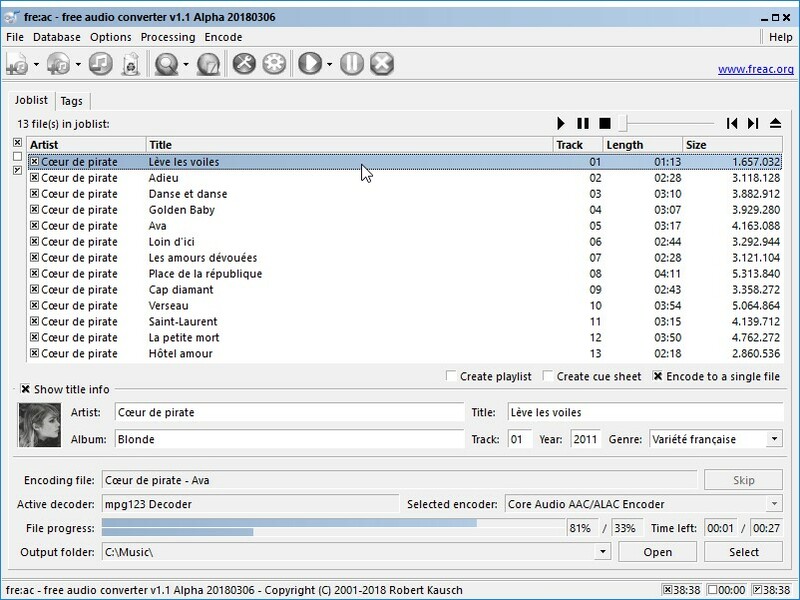 Hamster Audio Converter provides fewer output formats than its competitors, but it’s acceptable because the most popular audio formats are all included. It doesn’t let you save a default path for the output files, so you have to manually set the output folder every time. Most of the audio converter we list here organize all the key features in the main windows so that users can find and use them effortlessly. 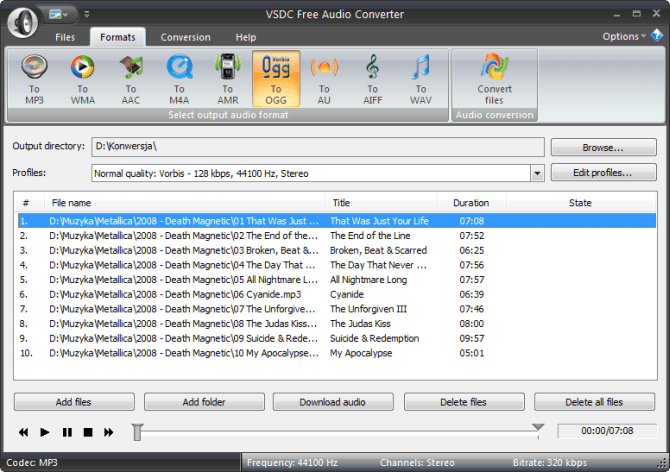 VSDC Free Audio Converter takes a different path: it has a tabbed interface, not that hard to use, but still, clunky and outdated. You are allowed to input audio files or enter the URL of the online audio to convert. It supports 9 output audio formats, each with several quality profiles. You can manually set the parameters like frequency & bitrate as well as edit the tag info. It includes a built-in editor in which you can delete the unwanted part of an audio file before conversion and this part will be removed after conversion. VSDC Free Audio Converter will try to install some unneeded tools and apps so be careful with the installation. DVDVideoSoft Free Audio Converter can convert between different audio formats like MP3, WAV, WMA, M4A, AAC and Ogg and like most other audio converter applications, each format comes with a corresponding profile kit. You can choose the output profile after you decide the output format. Meanwhile, you can create your own profile by saving your preferred parameters. The UI is very easy to use and you can batch convert audio files. DVDVideoSoft Free Audio Converter has some limitations and it will keep boring you with a nag screen to encourage you to buy the premium version. Also, remember to decline any request to install unnecessary tools. Total Audio Converter almost includes all the features you can expect from an audio converter. The speed is very fast with the excellent output quality. Everything is available at a reasonable price. It supports more than 30 audio formats and you can change the audio bitrate and frequency. There is a built-in player to preview the audio. You can use it to rip Audio CD and convert CDA to lossless or compressed audio. It allows you to trim parts of the track to get the exact part you want. You can also download YouTube video and capture YouTube audio with it. The trial version only allows you to convert 2/3 of an audio file so you have to buy the full version to get a complete resulting file. Some of its competitors make the trial version more “usable” so if you don’t want to pay anything, you should turn to other free alternatives. 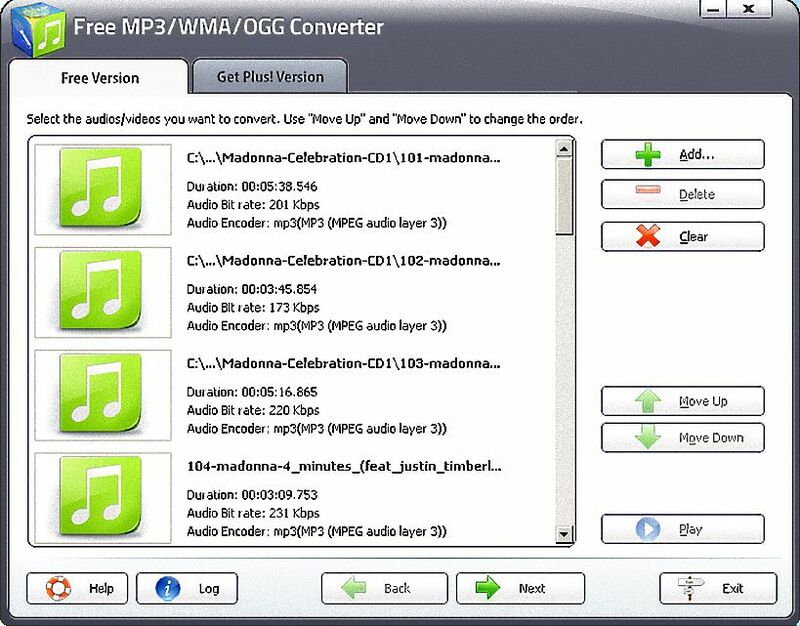 Free MP3 WMA OGG Converter is an intuitive free audio converter, which provides fundamental features. It can convert over 50 audio formats to MP3, WMA, AAC, M4A, OGG, WAV, FLAC, etc. It has many presets provided for each output formats. Free MP3 WMA OGG Converter may not come with bells and whistles, but it does the job, fair an simple. Just drag the audio files in then follow the wizard to finish the conversion. You can’t change the parameters manually, but there are plenty of presets for various devices. It would be a perfect choice for beginners. It can extract audio from video but you must purchase the plus version. Other than that, it does not set any limits. 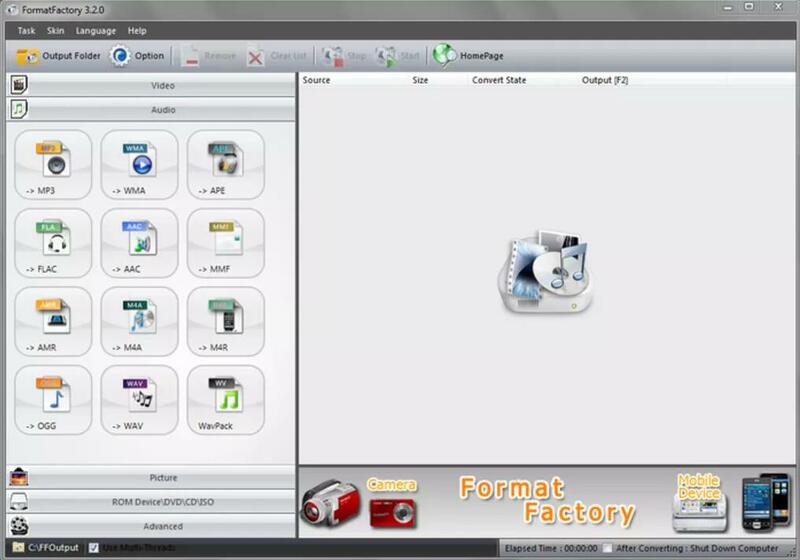 Format Factory is a multifunctional converter tool that can handle audio conversion, video conversion as well as video to audio conversion. It can convert your audio files to MP3, WMA, AMR, OGG, AAC and WAV. Just drag the audio files to the window and it will prompt a window to let you choose the output format and quality. Many parameters can be adjusted manually as well as presets. The conversion speed is fast. Format Factory tries to bundle some other software when you install it; also when you start the program for the first time. Its a bit complicated than other audio converters, which makes it not ideal for inexperienced users. 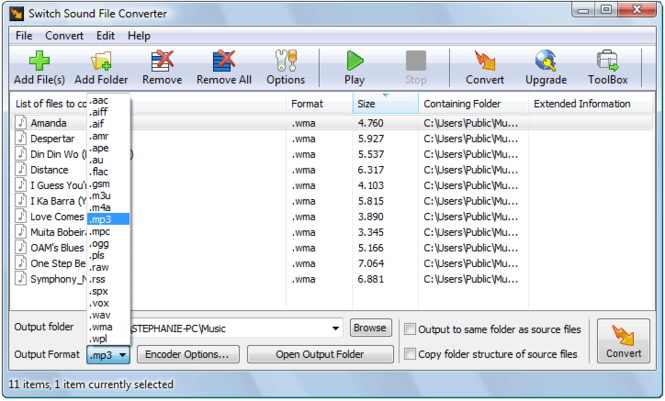 Convertilla is a media converter application that can handle batch conversion of audio formats including MP3, WAV, APE WEBM, OPUS, AAC, FLAC, APE, etc. Meanwhile, it provides quality profiles for iOS devices like iPhone & iPad as well as Android devices, Windows Phones, Chrome OS devices, etc. It has the most extended device list among our listed products. It has a tiny window that looks neat and simple. Convertilla can get the job done well and fast and its UI is appropriate for new users, but for users that require advanced features and looking for a multipurpose tool, it’s far from enough. Fre:AC provides all the audio conversion features as well as some advanced tools for free – it’s open-source software. 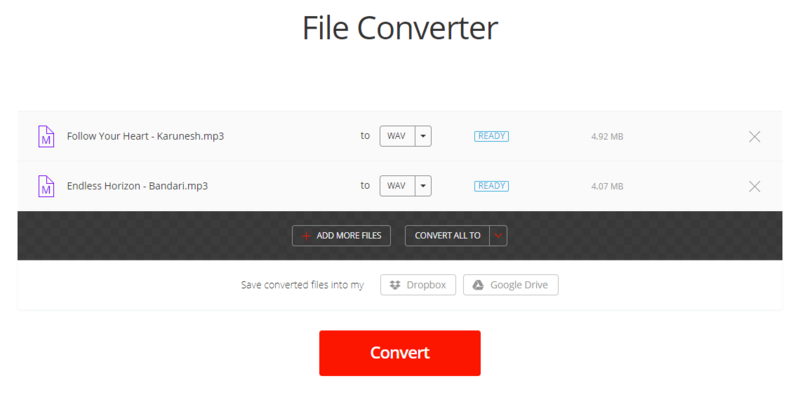 It allows you to convert audio in MP3, WMA, WAV, AAC, FLAC & OGG formats. A CD ripper is integrated along with the online CDDB feature. Fre:AC allows you to set audio quality parameters but it does not provide any presets, so it is not an intuitive choice for novices. The interface is outdated, neither intuitive nor easy to navigate – there are too many buttons crowded on the top, the fonts are small and the color scheme is poorly built. It is actually a complete copy of Any Video Converter because there is no major difference between them. It is a feature-rich audio converter that provides audio conversion, audio extraction, audio editing, online music/video download and CD/DVD ripping. You can change the sound quality after you decide which format to output. It can join the audio files into one, clip the audio before conversion and edit the tag info. Any Audio Converter will try to install additional software. It does not support drag-and-drop to input source audio files. There is no profile to choose for the output format, so it’s not for beginners. It is more like a video converter than an audio converter because it gives more video tools and options. TunesKit DRM Audio Converter is an audio converter that claims to convert DRM audio. We are not discussing the DRM-removal feature here, but it works just fine as a regular audio converter to convert non-DRM audio. Its UI is very user-friendly, with all the self-explanatory buttons and options. After loading the audio files, you can set the output parameters like codec, sample rate, bitrate and channel. You can also edit ID3 tag and split a large audio file into smaller segments. TunesKit cannot load audio files by drag-and-drop. It supports only a few output formats and there are fewer presets to choose. The trial version only allows you to convert 1/3 of an audio file. To get the full audio file converted, you need to purchase the full version. Super Audio Converter is freeware. It does not support many audio formats and can only handle the conversion between MP3, WAV, WMA, Ogg and VQF files. It is an elementary audio converter program without any other features but you can set the output quality. The conversion is fast and sound quality is excellent. Super Audio Converter’s UI is very intuitive and very familiar – maybe its because it looks decades old. The compatible format list is short and there aren’t customization options. It will ask you to download a “downloader” first, kind of like CNET downloader, to download the actual EXE file. During installation, you will be asked if you want to install some irrelevant third-party tools – remember to uncheck the agree box! As pay-ware, it provides fewer capabilities and gives more craps than other audio converters, so we simply suggest that you switch to worthier ones. The best free audio converter software – Free Audio Converter! Recommended for both inexperienced user s and pros! Now you’ve finished reading all the reviews of the 20 best audio converter software for Windows. All your needs can be fulfilled – you can convert any audio file for free or pay some bucks to get your work done. Remember to compare them to get the best one before you pay. If you don’t want to use any of the audio converter applications above & you don’t want to install any software at all, you can always go to an online audio converter. This is the most recommended online audio converter, which is completely safe & free to use, powered by FreeAudioVideoSoft.com. It supports all the most popular audio formats like MP3, WAV, FLAC, OGG, AMR, M4A and even M4R for iPhone ringtones. 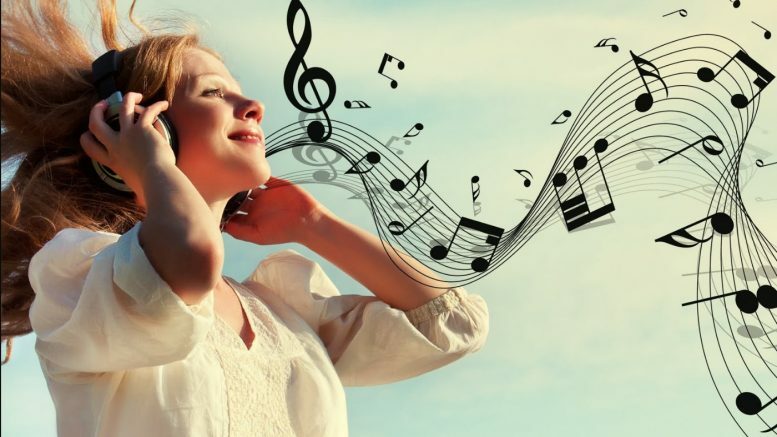 You can convert an audio file in size up to 200 MB, which is enough for regular music and lossless audio conversion. Meanwhile, you can upload an audio file from your PC or enter the URL of an online audio file to convert it. You are also allowed to visit this website on your mobile devices to convert the audio files stored on your iOS/Android phones and tablets. It will prompt an explorer window in which you can find and upload your audio file. You can also drag your audio file and drop it to the browser window. After you upload it to the online audio converter server, click next to choose the output options: 1. select an output format from the listed formats. When you decide which audio format to convert to, choose a quality preset from the drop-down menu below. You can also set the audio parameters like bitrate, sample rate and channels. Then, click next to start the conversion. A 3 MB song can be converted within 3 seconds. Then you can download it to your computer or mobile devices. FreeAudioVideoSoft.com also provides an online audio extractor via which you can upload your video to extract audio from it. 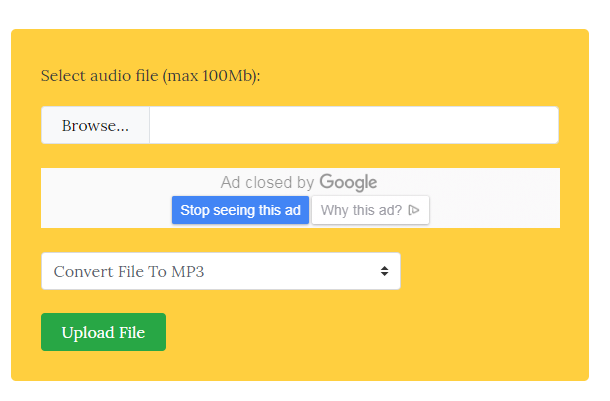 This is a free online audio converter that supports you to upload and convert your audio file from your computer, Google Drive, Dropbox or a URL. Drag and drop the audio file you want to convert to the website, then choose the wanted output format. You can use presets to control the quality or change the parameters manually in advanced settings. It allows you to apply Fade in/out effect, remove voice from your audio and reverse the audio. You can also edit tag info. After conversion, you can download the resulting audio file or save it to Google Drive & Dropbox. This is an online audio converter powered by Wondershare. It claims to supports over 1000 audio and video formats. 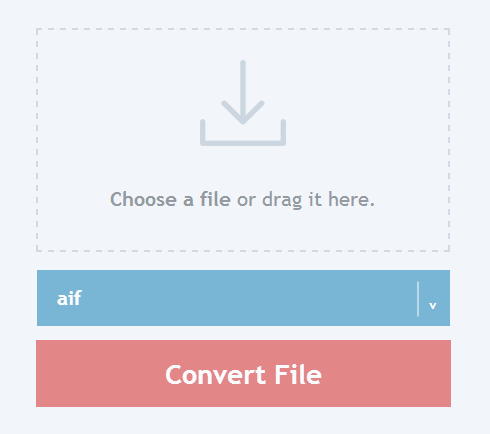 It does not support drag-and-drop, so you have to use the “Add your files” button. Meanwhile, you cannot convert online music by entering the URL. There is not any quality customization option. Its advantage is that you can add multiple audio files for batch conversion: if you are looking for a tool to convert a bunch of audio files, it could be handy; if you need more quality adjustment, it’s not a good choice. This online audio converter provides many output formats including video, audio, document, ebook and icon formats. You can drag the files to your browser or use a browser window to load your source audio. It allows you to input 6 files at a time, 24MB each at max, 144 MB at max in all. The output format list is very long, and it’s very hard to find the audio formats you need by using your mouse – you should click on the “Target” menu and type in the format you want; if it’s available, it will be highlighted and you can press enter to choose it as the output format. If you need more professional and easier audio conversion, you’d better choose the “Audio” tab on the left, which will lead you to another page specially designed for audio conversion. On this page, you can choose to upload the local audio files or upload them from Google Drive, Dropbox or a URL. You can change the bitrate and sample rate. It also supports cutting and merging audio. 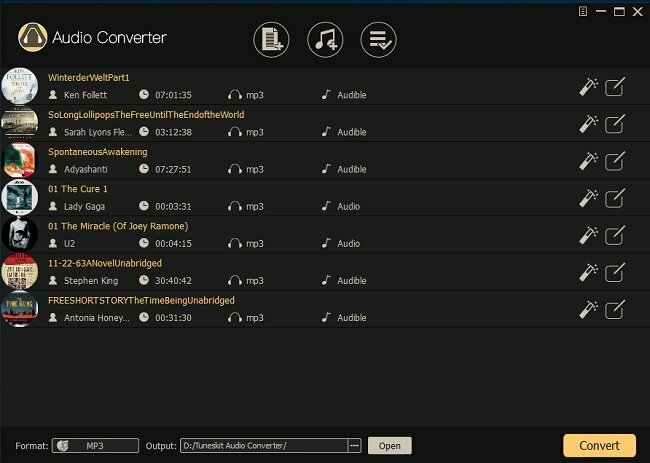 This online audio converter is very powerful, but it’s a bit confusing for new users. And the scattering ADs are annoying. 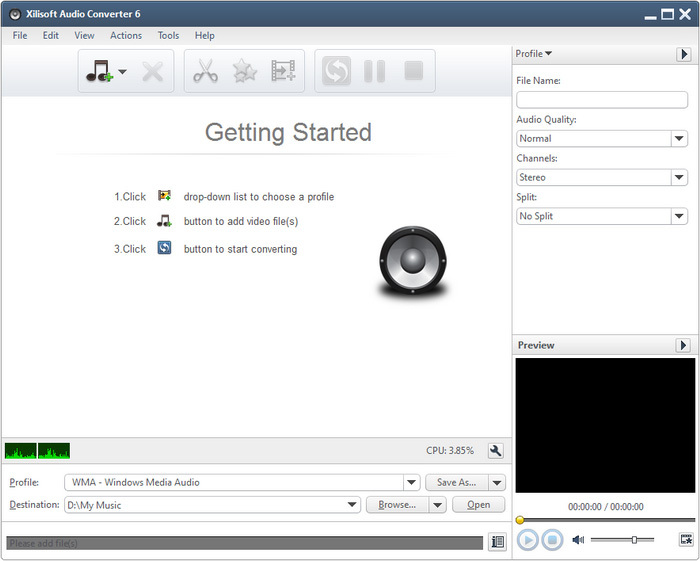 This online audio converter is provided by Dan’s Tools. It supports drag-and-drop. You can upload and convert one file at a time. When you input the audio file, choose the output format from the menu on the right. This is a very basic online audio converter which does not give any presets or quality options to tweak. Like aconvert.com, it also provides online converter tools for many other formats. This is a very fundamental online audio converter. It’s super easy: just click on the “Browse” button to choose your audio file in an explorer window, choose the output format from a drop-down menu, and click on “Upload File”. Then the file will be uploaded and converted. 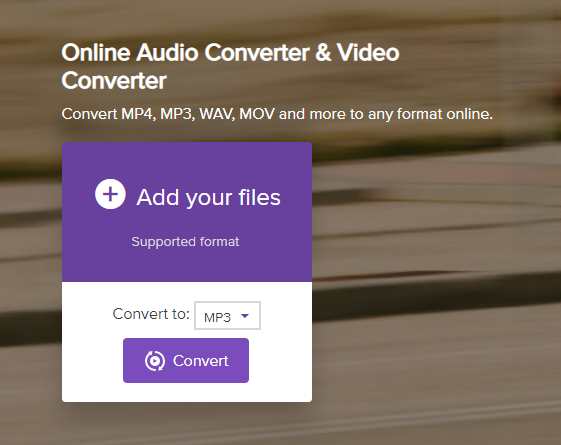 This online sound converter combines the “upload” and “convert” into one button. That’s at least one click fewer than other websites. However, its advantage list seems short. You can’t upload audio over 100 MB; it does not allow drag-and-drop; it does not provide any quality adjustment. This is a website that provides many types of online file converters. The audio converter is on the top. To convert your audio, you must choose an output format first from the “Select target format” menu and then click “Go”, which will take you to another page where you can upload the audio. 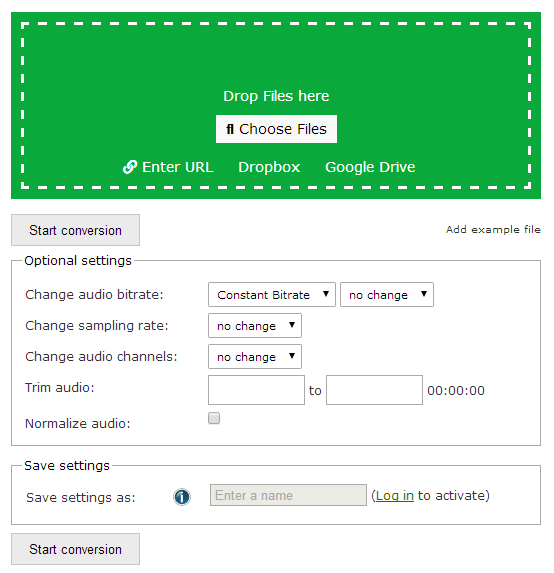 Drag and drop your audio files or transfer them from Dropbox, Google Drive or online music URLs. It allows you to upload multiple audio files for batch conversion. You are allowed to change audio bitrate, sample rate and channels. You can also trim and normalize audio. It allows you to save your preferred settings as a new profile, but it requires registry and login. This online audio converter does not give you any profiles for your target format, which mean new users may not know how to pick the best parameters. Unlike other competitors, it does not combine all the output formats in a simple page; instead, it assigns a page to each of the output format, which is unnecessarily complicated and confusing. I don’t see the point in doing this except for some SEO reasons. This online audio converter clearly knows what its users want. It comes with a very intuitive homepage with a large and simple bar in the middle. You can click the buttons on the bar to choose your audio files from an explorer window or directly drag your audio files to the page. After that, you can select the output format respectively for each of your audio files. If you want them all to be converted to a single format, just choose the format from the “CONVERT ALL TO” menu below. Hit “Convert” to start the batch conversion. One of the downsides of this website is that it does not provide any quality adjustment options or presets – you can’t change anything except for the conversion. When you upload a file in the source format, you won’t be able to find the same format in the output format list – you can’t change the quality of a file without changing its format. This site sets several types of limitations to your conversion, but there are some plans you can purchase for better service. This is a free online converter site that provides many kinds of converter tools. There are 5 tools to convert 5 types of files. 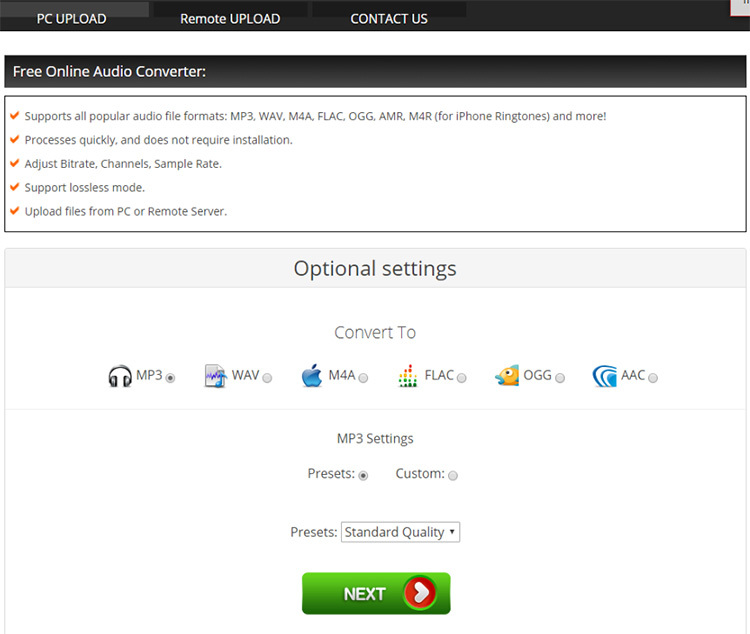 Click on the second one, “Convert Audio”, which will lead you to the online audio converter page. You can drag an audio file or use the explorer windows to upload it. Then, in the “choose format” menu, you can select the output format as well as the quality. Then, click “Convert”. It does not support batch conversion, so you are allowed to upload and convert one file at a time. There are not many quality control options to tweak. It combines the formats and quality standards into different options, which means you are not allowed to change the parameters manually, but you can select them by choosing a corresponding output format. Some formats just lack the quality options like WAV, FLAC, AIF, etc. This is an online audio converter that focuses on audio conversion and extraction only. Click on the “Start” button in the middle of the frontpage to go to its free audio converter page. Click on the “Select” button to load your audio file in the explorer window. It says it supports batch conversion, but I failed to import multiple files no matter how I try. After that, you can specify the bitrate, sample rate and channel. Finally, click “Go”. This is a very straightforward tool, with some 1-2-3 guidance. Still, it has its drawbacks. It does not support drag-and-drop; you can only upload 1 file at a time; the maximum file size allowed is 256 MB; there is no preset for quick quality adjustment; you must choose different online tools (go to different pages) if you want different output formats. Online audio converters usually have various limitations and it will definitely take much more time to convert audio files because you CAN’T manage to avoid the “upload-download” process. The perfect once -and-for-all solution is to download the best free audio converter software and convert all your audio files without the need of network connection.